Phew, it has taken a long time to build this vacation home, but it is almost finished--or will new projects continue to spring up? Charleston del Costa Rica is certainly a fun place to spend leisure time, as well as a perfect environment for relaxation and gardening. 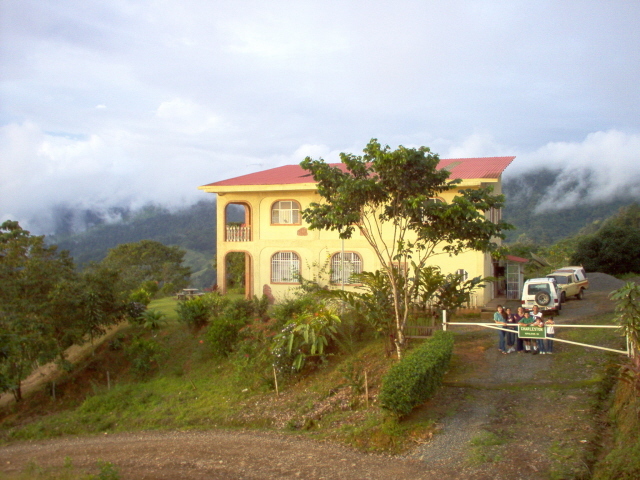 Located in Central America, our Costa Rica retreat is about 75 miles north of the Panama border. The ranch's banana, mango, citrus, coffee, and other trees dot its 6 1/2 acre landscape, and there are several garden areas for fresh vegetables--they are almost-daily watered by the refreshing tropical rains that also drains into the valley that drops about 1,500 feet. Beautiful sunsets are visible from the full-width porch and balcony facing the Pacific Ocean, about six miles to the west. Sometimes the sun reflects dazzling gold off the Pacific; at other times it radiates fiery red through the clouds and paints the smooth water with a mellow flame or plum color. The living room boasts 750 square feet and accesses the kitchen through a serving counter. The cook, women, and men each have their separate rest rooms down stairs. The second level has two more rest rooms, and three of the bedrooms have high-ceiling lofts for extra beds. The three upstairs windows, seen in the photo, offer beautiful views from two more bedrooms and the sitting room next to the balcony. Because the house is on a peninsula, any window you look from has a spectacular view of the valley which descends about 1,400 ft below. A tropical ocean breeze continually moves fresh air upward to a perfect temperature at about 3,000 feet elevation; tropical birds sail majestically on these updrafts with leisurely precision. Some birds, like this toucan, are more splendid than one sees in a pet store. 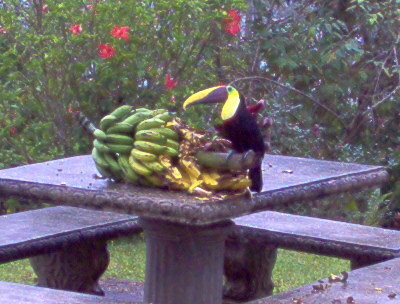 They dazzle the view and often visit our banana trees. Charleston is located at cloud-level and the clouds break the sun's afternoon heat, often forming a refreshingly cool mist, more invigorating than a spring rain. Year-round temperatures are about 13 degrees cooler than the beaches, and central air conditioning is unnecessary because the climate and humidity is Heavenly. Average temperatures range daily between a low of 65 and high of 85 year round. This is a view of the house while ascending the fertile valley. The tall palm trees to the left have clusters of edible fruit that is boiled in salted water and dipped in sour cream. Some call it a peach palm, but the locals name it piejevalle (pe-hay-vah-yaah). Behind the house are power lines providing full electric service, and the Municipal offers spring-soft domestic water piped from a flowing artesion well in the mountain nearby. The Costa Rican's are very friendly, and in this community they will rent you their horse for a ride to the valley; or, about two miles away is Baru Falls (see link below) which is also accessible by horse or foot. For the more energetic, it takes about one and one-half hour to backpack to the falls. The bus stops regularly where the asphalt highway passes our eastern boundry on its way to the ocean; or, the opposite direction to the main town with five ATMs--use these to deduct money from your U.S. bank for shopping and dining. The 25 minute bus ride costs about $0.80 each way, which is very reasonable considering the 12 mile journey. Access to the beach is free, and many restaurants dot the shoreline. Tourists find it attractive, even traveling from Europe and Hawaii to visit the coast and surf in the fresh tropical water. Others leisurely bask in the sun on the clean white sand that skirts the tropical rain forest's beach. Costa Rica was named by the Spaniards and means rich coast. It is correctly called "the Switzerland of the Americas." As you can see, we shopped wisely while looking for a retreat, and God has blessed us more abundantly than we ever dreamed. When the blistering sun's heat radiates from your sidewalk and the car's hood can fry an egg; or, your water pipes are frozen and the driveway needs de-iced, these are excellent times to pay us a visit at Charleston del Costa Rica.